In the news this week; IBG discussions warm up over ‘GOTM’ – with the longest thread in the history of the club, and individuals writing more words than exist in Oxford Concise, it’s great that our passion for gaming is so much in evidence. So, on to the reports… many thanks as ever to Jon, but also to Tom for a great review and Dan II for his first written words, and in poem form, that rhymes, how brilliant is that!?! As I missed the week I’m led to understand that the attendees were; Jon, James, Dan II, Gareth II, Tom, Philip, Gareth, Barry, Andy, Noel, Brother Paul, now there must have been a couple of others for Gareth to play TtA with, I’d go for Barrie and Michel although I could be wrong, in fact I’m quite used to being wrong, especially at home. In fact I was right once and that really did confuse me ! Leaving feudal Japan behind (and several dead sentries in their wake), James, Tom and Barry agreed to try out Stone & Relic, the new card-based kingdom building game from Small Box Games. The games is contested on a number of different fronts: largest kingdom, prosperity (achieved by a player placing cards under their wealth card), obtaining relics (of which there are four), and structure VPs. The vast majority of cards have a number of functions which include base VPs, spell actions, abilities (which often activate when the card is placed in a kingdom, or structures are played next to it), power (key for obtaining relics and accumulating wealth) and affiliation. There are four different affiliations which match each of the four relics which will come into play. 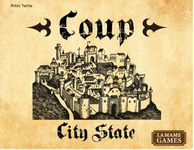 To make matters even more complicated, the reverse of each structure card shows a city. Cities are developed from existing structures in a kingdom through the use of a build action. Cities are worth 3 VP (higher than all of the standard structures other than those whose VP are based on attributes of the player’s kingdom) and contribute one power for the purposes of both relics and wealth. The downside of the city, however, is that the existing VP, ability and relic affiliation of the structure are all lost; the latter may affect the VP of other structures such as the Steam Needle which is worth 1 VP for each Cog structure in play. Each player’s turn consists of a resource step (drawing cards), expansion step (expanding your kingdom), and the relic step (assessing whether there are sufficient cards in play to award the relic and, if not, playing a further card next to the relic). For the resource step, players draw two cards unless another player has more card in their kingdom at which time they draw three. Therefore, early expansion by one player will give the other players more options ion their hand. In the expansion step, the player can either take one action or two actions (the latter only if the player discards a card from their hand). The actions are: build action (place a structure into the kingdom or develop a structure in play), spell action (discard a card with a printed spell action and use that spell), wealth action (place a card under your wealth card), or influence action (place a card face-down next to the relic card in play). Once all actions are taken, the active player discards down to four cards. During the relic step, the active player assesses whether there are seven or less cards played next to the relic card. If so, the player draws a card and then places a card face down from their hand next to the relic. If, however, there are eight or more cards, the cards are turned over and the player with the most power icons wins the relic which is worth 5 VP at game end. Not only do cities add 1 power icon for a player, but each card affiliated to the relic’s bonus icon give +1 power also. Play proceeds until the draw deck is exhausted (very unlikely considering the frequent shuffling in of the discard pile) or a certain number of structures are played in one kingdom, e.g. nine structures in a three player game. Each player then gets one more turn after which the largest kingdom card (worth 5 VP) and the prosperity card (worth 7 VP) are handed out to the relevant players. In brief, it’s an exercise in multi-tasking, keeping an eye on your opponents (with minimal take that) and prioritising accordingly. Tom despite having played the game before singularly failed in this task. James managed to obtain one or two relics, Tom had one also and there was a dead heat for another between Barry and James which meant the relic was discarded. The largest kingdom was another dead heat between Tom and Barry, meaning that it too was discarded. Barry won the Prosperity card by a gnat’s length from James meaning a 14 point VP swing which proved decisive in the endgame with Barry being triumphant. Barry subsequently marched into Tom’s kingdom in his new ultra bling crown, declared it an inefficient, terrain heavy monstrosity and made all its inhabitants cry. The meanie. It’s a game that takes a little while to get used to the mechanics, hence the long rules explanation but it is very rewarding on a gameplay front, especially for a pack of cards. Put it in the Manny Pacquiao school of small packages with a lot of punch along with Verrater and other luminaries. Could three of us get Through The Ages, Four? They told me that it had been done before. Times that by four, and that's three hours. Great! But Gareth II helped setup, which was handy. A dictator with colonies who fought you all. As Gareth went for points, so Andy spurned them. Selective breeding? I think he was German. With Bonaparte's advances... and operatic dances. In racing they would call it by a nose. Just 10, the gap between us, first to third. Could we have missed a score or two? Absurd. And I also got the blog report to rhyme. With a few ‘late boys’ arriving at 8pm, including Noel and Jon, this game was a shoe-in. I’m not sure that Noel’s brother, Paul, was given any choice, and Philip had also opted / been forced to join in too. The map chosen was Europe, which works great with 4 players. The game was new to Paul, so Noel gave him some fairly thorough instructions which got him up to speed. The first set of cards available included a service bounty to Moscow, so Philip bid a relatively large amount to go first and build this link. This gave him the first cube bonus too, so quickly took him up to 5 points. Noel built Hamburg to Berlin, which is when Paul then stepped in to immediately build Berlin to Prague. Noel was not amused. Jon was. Jon played the ‘Noel strategy’ and quickly built the Amsterdam to Marseille route for the first Major Line bonus. Noel had turned his back on his brother, and moved down to Spain, to pick up the ‘4 different cubes’ bonus. The ‘3 link’ bonus wasn’t picked up for quite a while, bit it eventually went to Jon. 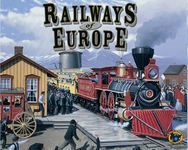 The game settled down with Philip being left entirely on his own in the East, building a little circular route and eventually heading towards Vienna for another Major Line bonus. Paul had moved down through Eastern Europe and was now tussling with Noel again around Northern Italy. Jon moved west to Brest, and hoped that he had locked up enough cubes, as his track expansion options were now pretty much non-existent. For much of the game, Noel had only a level 1 engine, but was picking up his points from completing Major Lines and collecting other bonuses (including a few free delivery points courtesy of Paul). He was almost completely blocked from connecting Spain to Italy, when Paul decided to build Marseille to Barcelona (cue more grunting and huffing), but Jon played nice and didn’t build the final link out of Marseille, leaving Noel able to take a slightly longer route round. In terms of bonds, Philip’s early splurging soon came to a halt, and he finished the game with only 6 bonds. Jon expanded his network quite early and soon had 9 shares, whereas Noel invested slowly and surely, although still finished with 9 bonds. Paul was slightly more gung-ho, and soon had 12 shares, leaving him with not too much income in the middle game. The game was coming to a conclusion, and Jon was finding his hoard of undelivered cubes too much temptation, and he lost a couple of valuable ones in Copenhagen to Philip, and a few more to Noel in Paris. But the game ended at just the right time for him – he completed a few 5-link deliveries (giving Paul a few points in the process) and had stretched out his lead enough to overcome his bond deficit to Philip. Noel finished ahead of Paul, but that was scant consolation – I suspect that Paul was sleeping on the sofa that night….. It was interesting that Noel’s (slightly forced) strategy of getting early points from bonuses and Major Lines very nearly paid off, although it is slightly easier to block than a delivery strategy. Nice to see even more depth in this great game.